KoopaTV: Judging the Father by the Actions of the Son? There he is, on our right side. He's even glowing. By the way, what's with Hillary's microphone? It looks weird. What do Hillary Clinton and Mario have in common? Well, they're both pure evil. That's a really good start. Um... I don't really know what else there is, specifically. It's not my job to theorise on that. I don't do speculation on this site. I do commentary. So. Commentary. And individualism vs. collectivism. Well, Hillary obviously views people in collectives. That's just part of her ideology. She wrote a whole book about it, It Takes a Village. By the way, you can't judge Ron Paul by anything his son, Rand Paul, has done. They're both fantastic on their own merits. Suppose Mario had a son (...ugh) and the son went and pelted, oh, I dunno, the Coney Island Disco Palace with fireballs. 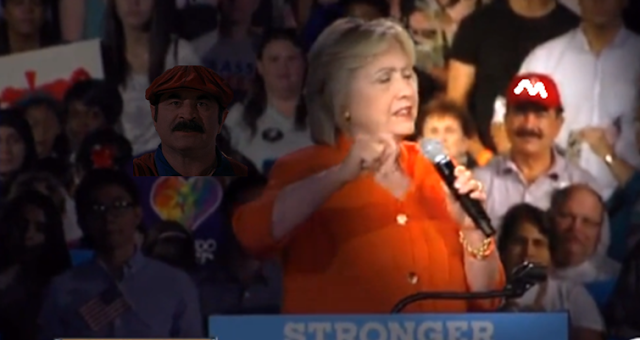 Mario then shows up to a Hillary Clinton rally. Should he be THAT GUY who is known as “the father whose son burned up the Disco Palace and killed dozens of Koopas”, making a news story via that? No. Mario is an awful person on his own demerits. Mario's hypothetical son may have learned bigotry and violence from his dad, but unless Mario told his son to go do that, Mario had nothing to do with Mario's son's violent actions. Therefore, don't spread the blame and horror of Mario's sons actions past anyone but Mario's son. Spreading responsibility across people who aren't responsible is a form of gross dishonesty, and that dishonours the memories of those who were victims. ...Oh, but Hillary Clinton is responsible for the September 11, 2012 terrorist attack on Benghazi either way. There's a difference between being Secretary of State and having something bad happen in the world (you are literally in charge of it, and it's a problem when you ignore cables begging for help and added security. Oh, and the whole lying and covering-it-up part was absolutely her own doing.) and simply being the father of a grown man who makes his own independent decisions. You're not responsible for the actions of non-minor kids. You, as a parent, should be able to relax once they're adults. You should. Don't let the media or anyone else tell you otherwise. If you thought this article had a weaker premise than usual behind it, you can blame KoopaTV staffer RawkHawk2010 for that thought-crime. He left Ludwig these instructions before going to bed at 4 PM: “This is literally Mario. Mario is Hillary's biggest fan. (Write about that. )” But if you liked it, say so in the comments so he can feel vindicated. In an alternate world, Mario is actually from Brooklyn, New York, and is opposed to Hillary Clinton and Princess Peach. Speaking of fathers and Mario, Mario's spotty upbringing may be partly responsible for his horrendous actions. Ludwig once wrote that naughtiness encourages individualism, and niceness encourages collectivism, and that Mario fancies himself as nice. For another article with gaming characters hidden in a rally photograph, look here for Bernie Sanders and Phoenix Wright. It's a bit weird that Mario would support Hillary Clinton given her very anti-videogame stance, but maybe Mario isn't smart enough to know what's good for him. Mario liked associating with President Barack Hussein Obama, too. Mario has really let himself go. He went from being the first plumber in the Olympics to a Hillary supporter faster than the spread of Zika. My only conclusion is that he has contacted the virus while in Rio de Janiero before he escaped. What else can explain his delusional views? But....but... I got the virus too and I don't remember being delusional! Koopas are immune to the adverse effects. Humans, on the other hand, are not. That is the logical explanation, according to the magikoopas anyway. I dunno, I got headaches and funky stuff on my skin. You saying that was possibly some of the OTHER possible viruses one can get in Brazil?! So what do you think of individualist vs collectivist societies in general anyway? I mean, isn't that clear? Individualist societies are much more prosperous and better. My article was better then this is. Is that because it came from a Rawk idea, or did I have bad execution on a good foundation? I'd like the website more if I got another guest article or 7. ...Well, go write another one. I just have to fine tune it. Wow, you're actually polishing it? That's already better than the first one! ...well the point is that you didn't try for the first one. That article has been regarded as "The saving grace of KoopaTV." They'd like to stay anonymous. Well, I don't see anonymous commenters sayin' that, or anonymous responses to KoopaTV's Feedback Form Part V.
And if some suddenly prop up, I'll know it's you. You don't know my motives.